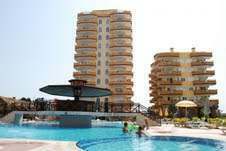 The Sunset Complex of 4 apartment blocks, surrounding two large outside pools (with an indoor pool in Block 3),is located on the edge of the sub urban town of Mahmutlar, 14km east of Alanya City. It has uninterrupted views of the famous Taurus Mountains (5km), the Mediterranean Sea (50m), the famous setting sun over Alanya Castle (15km) and is only 25km from the Gazipaşa Airport. This is the ideal location for anyone who wants to be close to all amenities while still enjoying the rural aspects. This prime Duplex Penthouse is in very good condition and is being offered for sale fully furnished to a very high standard with all mod cons. For further information please submit your details on the on-line system provided or you can call us direct on 0090 242 528 5551. For sale in the new building on Jikia 2-room studio type at the level of the white frame on the eighth floor, the building will be put into operation on May 30, good access and access. prestigious residential environment, transportation. For sale in Nadzaladevi, on the top of Tsotne Dadiani Avenue, a major private house, iron gate, parking for 4 cars on the first floor, verandas, internal and external stairs, good view, good access and access in a quiet residential area. For sale in Ortachal 1 room apartment converted to 2 rooms, an iron door, telephone, internet, heating for "Karma", hot water at a gas stove, a kitchen and a bathroom with a repair and the rest is intact, good access and access, transport. For sale in Vashlijvari 2 room apartment, access from the street, elevator, steel door, all communications, heating on the gas stove, hot water on the gas stove, needs cosmetics, 1 balcony, good access and access, transport. Sale 5 room apartment, entrance from the street, elevator, metal door, telephone, Internet, cable TV, gas, heating on the gas stove, central heating, 80m2 of the hall, separate kitchen, balcony, very prestigious place and surroundings, Transportation, Metro. For sale in Pekin N24 commercial space of 80 sq.m., black carcass. 1 (8) floor. For sale in Pekin N24 commercial space of 80 sq.m., black carcass. 1 (8) floor. ☎: 571386550 Owner . Two bedroom apartment (66.7m2) in a new house on Gorgiladze 94. Balcony with city and mountain view. The sea across the road. Near McDonald's, Batumi Mall, dancing fountains. 2 bedroom apartment for sale in Tashkenti str.